Description: Ice Princess injured herself while going for a walk with her reindeer, now you must go to the emergency room and take care of her. Be the best doctor and give the princess the right treatment. Get rid of the wood branches, clean her wounds and use the X-ray to see if she has any broken bones. 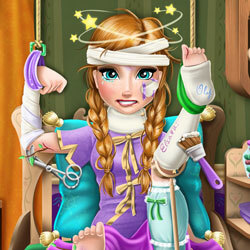 Place casts with cute messages from her sister and friends and Ice Princess will be ready for a new exciting adventure!